What is your favorite part of what you do? I love cooking: it’s what I was meant to do, it fulfills me, and it’s what I’ll do for the rest of my life. When people tell you to do what you love, and you’ll never work a day in your life — that’s really true for me. 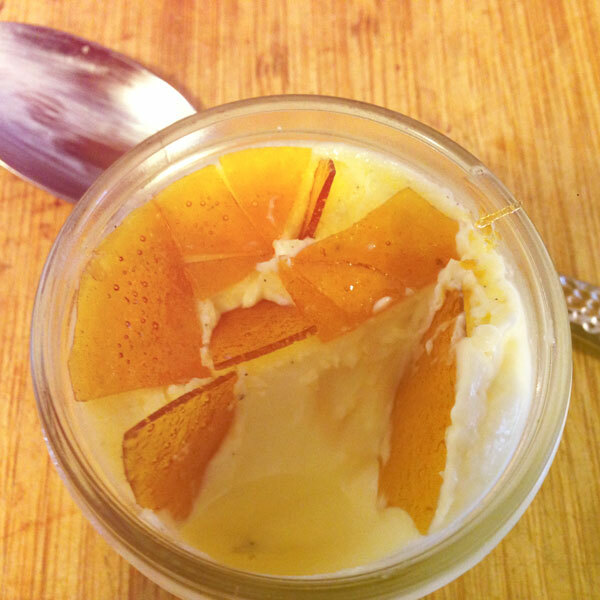 What inspired you to start EK’s Crème Brulee? I was living in a small town in northern California last year, and sold these little crème brulees at the farmer’s market, potted up in mason jars and blow torched to order. They were incredibly popular, but I noticed that a lot of my customers were taking them home to enjoy later, or use for entertaining. The problem with taking crème brulee “to go” is that the sugar on top goes soft quickly after exposure to moisture or oxygen, and not everyone has a blowtorch at home, or wants to use one. Eventually I came up with a way to make the hard caramel topping and package it separately from the custard. It was really challenging, but I figured out how to have this delicious crème brulee with the thin disk of sugar on top, no blowtorch required, and no rush to enjoy it. When I moved back to Portland last year, New Seasons Market picked up EK’s Crème Brulee in all of their locations. I officially launched in September of 2014, and the rest is history — or yet to be seen. What’s next? My whole life is really run by food, I’m always obsessing about it in one way or another, so I keep myself busy. I grow a garden in my backyard, I’ve run a food truck, and a wood-fired pizza stand, and I’m working on a pop-up brunch spot for this summer called Burnt Toast. And, of course, I make EK’s Crème Brulee. This is my first experience with this kind of business, so right now I’m focused on growing it slowly but surely, continuing to work with the best local and natural ingredients I can find, and sharing it with as many people as I can.